In this letter Camilla L. Edwards tells Martha Berry that she has for many years supported a school in North Carolina, but she says that it seems like there are far more girls in school than boys and she worries that they will surpass their cousins and brothers. She is praising Martha Berry for allowing boys and girls into her school. She also updates her address for the winter. 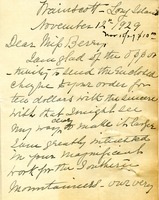 Martha Berry's letter was sent with an order for some nursery stock. 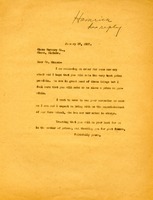 She asks Mr. Chase for his best price for her order and tells him that she would like to visit his nursery with the Superintendent of Berry's Farm School. Martha Berry expresses her appreciation for the favorable pricing provided to Berry in the past.